Part two of our search for asian bridal outfits online, takes us back to 2005 yet again! 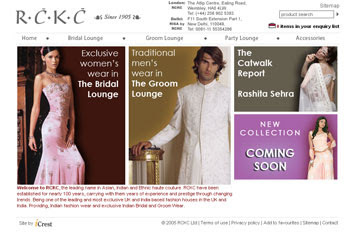 RCKC - with a store in London and one in India, RCKC have been established for nearly 100 years. The Bad Stuff: this site hasn't had any new outfits added since 2005!! So even if you find you're dream dress, the chances of ordering it 2 years later are slim. This site is more of an advert for the actual shop, but having never visited the store itself, I can't comment on whether this nice website goes with a nice shop! i like the fashion sections in pinkvilla better..
Hie, Thanks dear for this lovely site and information, i like many of your post, Reading your post and i hope to contribute in this, I also have found one good site for wedding sherwani and lehenga may be you like to add this in your list - http;//www.rajasthanistore.com , i love this store collection.